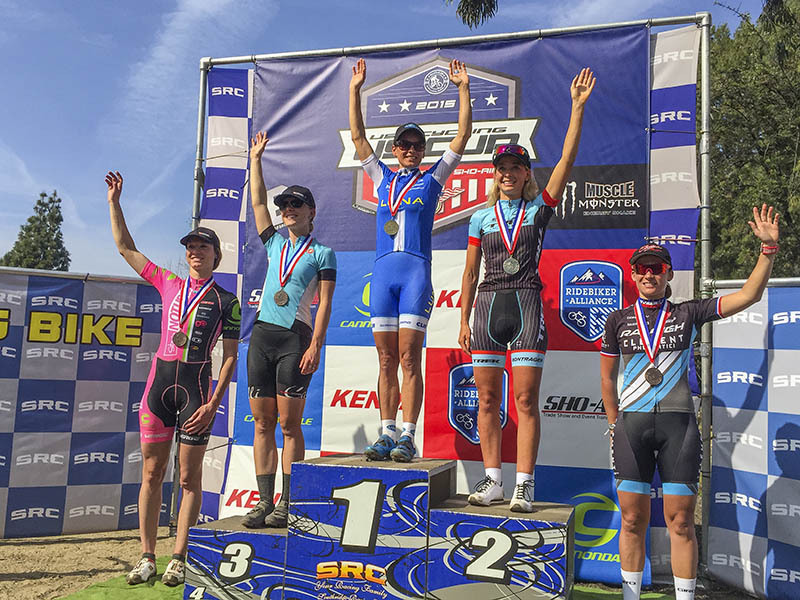 Katerina Nash (Luna Pro Team) and Todd Wells (Specialized Factory Racing) won the short track cross country races at the USA Cycling's US Cup Pro Series presented by Cannondale at Southridge Park in Fontana City, California, on Sunday afternoon. 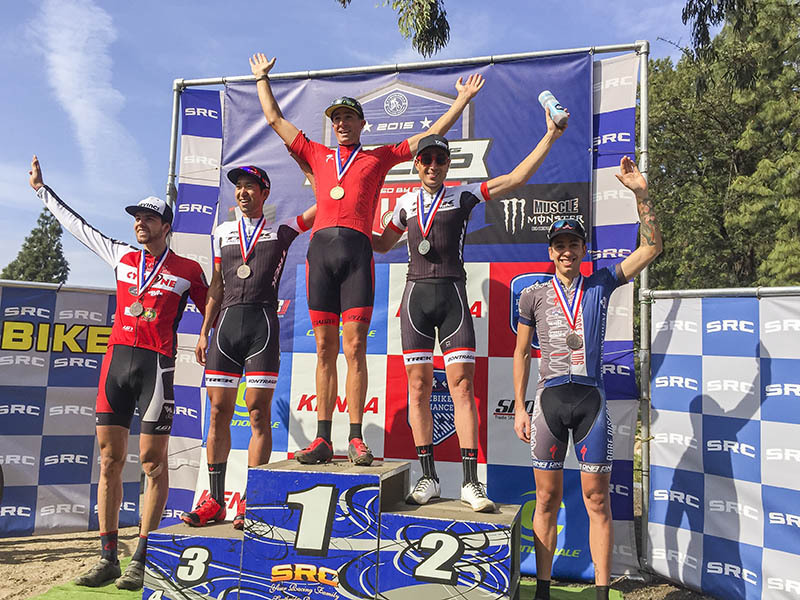 The race wrapped up an exciting weekend of racing, with riders heading to all corners of the globe in preparation for World Cup events or the next US CUP round in three weeks and the Sea Otter Classic. The 31-strong field of women's racers lined up for fifteen minutes plus three laps of a dusty course that featured a pair of tricky bumps on the far side. Trek Factory Racing's Emily Batty was crafty in shooting under the charging Luna Pro Team on the first turn to take the hole shot. After the first fast lap, it was all strung out, with the Luna Pro Team leading the way. Lap two saw Chloe Woodruff (Stans No-Tubes-Niner) lead through the start/finish line, with Haley Smith (NORCO Factory Team) in second. One lap later, the Luna girls reclaimed their place at the front, with Catharine Pendrel and Georgia Gould being joined by teammate Andrea Waldis, who was doing some fine teamwork for her leaders. Behind them were Smith, Batty, Woodruff and Rose Grant (Stans No-Tubes). A general regrouping took place on lap four with one notable exception as Gould flatted and withdrew from the race. Things heated up two laps later and showed the determination of the field, as some bumping occurred at the front on that first left-hander after the start/finish line. With just two laps to go, the front group grew to fifteen riders, all battling it out for the win. On the penultimate lap, Nash and Batty made their selection, charging hard to establish the winning break. The field exploded at that point, with riders being strung out for the remainder of the race. In the final run to the line, Nash charged to the win over Batty in an exciting and hard-fought sprint, with Woodruff, Grant and Caroline Mani (Raleigh Clement Cycling Team) filling out the podium. "This is such exciting racing for us, where we can all race so close together," explained Nash. "I was in the right place at the right time, just like yesterday, so it was a good weekend for me. I knew I was in a good position when I was third at the top. There are so few places to pass here but I found my spot and was able to take the win!" The men's race was also fifteen minutes plus three laps, and Raphael Gagne (Rocky Mountain Bicycels) showed yet another sign of his great form, taking the hole shot as the large men's field kicked up a dust storm at the start. Unfortunately, the Canadian rider had some bad luck and went down in the first hectic lap, which created a gap and the eventual winning move. Todd Wells (Specialized Factory Racing), Kohei Yamamoto (Trek Factory Racing) and Russell Finsterwald (SRAM/LTD Racing Team) were the beneficiaries of the resulting gap, and these first two remained out front for the remainder of the race. By the third lap, the gap to the chasing group was at eight seconds. Halfway through the fifteen minutes, Wells put in a huge effort at the start/finish line and attempted the solo break. Two laps later, his lead was up to fourteen seconds, which he more or less held onto until the final lap allowed him to ease up a bit. With four laps to go, Finsterwald was replaced in the first chase duo by Yamamoto's Trek teammate Sergio Mantecon. This group was chased by Stephen Ettinger (Sho-Air/Cannondale), Leandre Bouchard (Equipe Quebec), and Estonian rider Martin Loo. Wells kept the pressure on and cruised the last lap in to take a commanding win of the short track event. Trek Factory Racing's Mantecon preceded his teammate and Japanese sensation Yamamoto, while Bouchard was followed in by Cole Oberman (Rare Disease Cycling). "I heard a big crash on the first lap where there's a blown out hump in a bottom corner and someone washed out there," said Wells. "I got a separation with Kohei and Finsty and could tell I was gapping them a little bit on the downhill so I hit it. I looked up and we were only like six minutes into the race! I'm a steady rider so it was better for me to ride at my tempo. If I can get there by myself, I don't have to follow the surges so it was better for me to ride steady by myself."